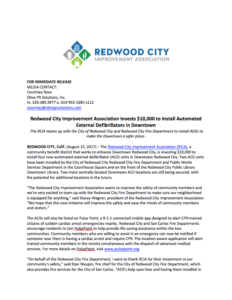 The Redwood City Improvement Association (RICA), a community benefit district that works to enhance Downtown Redwood City, is investing $10,000 to install four new automated external defibrillator (AED) units in Downtown Redwood City. Two AED units have been installed by the City of Redwood City Redwood City Fire Department and Public Works Services Department in the Courthouse Square and on the front of the Redwood City Public Library Downtown Library. Two more centrally located Downtown AED locations are still being secured, with the potential for additional locations in the future. The AEDs will also be listed on Pulse Point, a 9-1-1 connected mobile app designed to alert CPR-trained citizens of sudden cardiac arrest emergencies nearby. Redwood City and San Carlos Fire Departments encourage residents to join PulsePoint to help provide life-saving assistance within the two communities. Community members who are willing to assist in an emergency can now be notified if someone near them is having a cardiac arrest and require CPR. The location-aware application will alert trained community members in the vicinity simultaneous with the dispatch of advanced medical services. For more details on PulsePoint, visit www.pulsepoint.org.